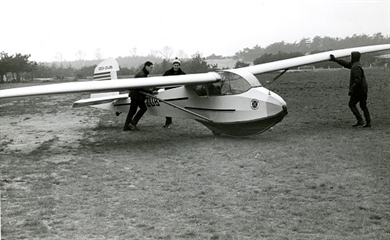 The Rhönlerche is a tamdem two-seater training sailplane. It is the first design of Rudolf Kaiser for the company Schleicher which is one of the oldest sailplanes manufacturer in the world. The goals were to produce a simple, inexpensive and robust two-seat trainer for school and club use. 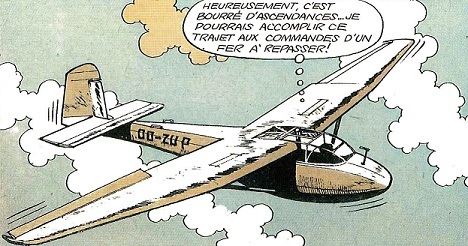 It fulfilled plenty these aims and, in Belgium, was used by the Cadets de l’Air to train young peoples interested by aviation. Nearly all the clubs had at least one in their fleets and many pilots were first trained on this sailplane. The Rhönlerche has a fabric covered welded steel tube fuselage while all the airfoil is a fabric covered wooden structure , including fin and rudder. The braced high wing has a single spar wood structure with a plywood covered leading-edge torsion box. First flown in 1954, it was produced at 338 examples and many are still flying. 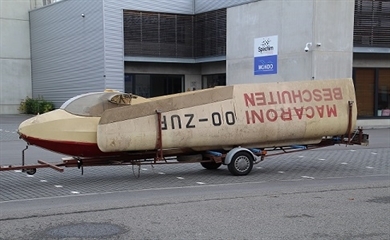 The BAPA’s Rhönlerche, Wr nr 650/59 was built in 1959 and registered on 9/5/1962 as OO-ZUP for the Centre National de Vol à Voile ( CNVV). Cancelled from the register on 13/1/1978, it was bought by one of its pilot, Marcel Janssens who stored it at home for a future restoration. This never came and it was given to our association by the Janssens family. Status : complete but restoration required.